The Mortgage Lender Implode-O-Meter News Pick-ups: Imploded: Windsor Capital Mortgage Corp.
Update - 2009-10-15: We've learned that loan 'solicitors' who had been working for Windsor Capital Mortgage in the State of Hawaii for the past couple of months may have unwittingly been practicing without the benefit of a properly licensed Broker, which according to Hawaiian authorities can invalidate all mortgages written/funded within certain timeframes. Escrow and Title companies would have had no idea... the State web site as of this date still shows them as "CURRENT, VALID & IN GOOD STANDING." Based upon documents presented to us we know Windsor Capital Mortgage had their required Bond cancelled on May 4, 2009. After we published this story (see below), Windsor (we assume) presented the Hawaiian Department of Commerce and Consumer Affairs (DCCA) a replacement bond, a copy available here. Windsor Capital Mortgage's license to do business in Hawaii ended when this replacement Bond issued on 2009-04-02 by North American Specialty Insurance Company/Washington International Insurance Company (NAS/WIIC) was cancelled on 2009-08-19. Hawaiian law appears very clear: Hawaii Revised Statutes, Chapter 454-3(c): "A mortgage broker's license shall not be in effect at anytime when the bond is not in full force and effect." -- No Bond - No License. We spoke with the Underwriting Dept. at NAS/WIIC who confirmed "Cancellation of that bond became effective 8/19/09" and told us it was the originating Agent that had requested the cancellation in an email, relaying that the company was no longer operating and an audit (by said Agent we're told) had indicated they would be going out of business in the 2nd quarter of 2009. We have been told that the above Bonding problems, and the question of having a legitimate office address has passed the 'intake' department of the Regulated Industries Complaints Office (RICO) and is now in the hands of the Field Investigations Unit. At stake is the potential voiding of any mortgages written or funded since August 19 2009, and perhaps voiding ALL mortgages written by Windsor Capital Mortgage Corporation since they opened an office in a residential neighborhood on Maui. It's interesting to note the Insurance company tells us they have proof they sent out a 60-day notice of cancellation of the bond on June 16th to both Hawaii and Windsor, yet it was just recently presented to the State of Hawaii in October as valid. Hawaii still shows 19 licensees (view cached), although 7 of them appear to live in California. Hopefully all are aware of the situation. Original Implode Listing - 2009-09-25:To quote from the San Diego Better Business Bureau's web site: "It appears that this business is no longer in business" and "This business has no rating because it is out of business." Windsor Capital Mortgage Corp. (view cached) has been reduced from the nation's second largest mortgage brokerage with over 1800 loan officers to a "phantom" shop with only one or two licensed originators (or perhaps none at all) doing business out of a UPS mail drop. The web site has disappeared, becoming a blank white page on or before 2009-08-20. Phones remain unanswered and the company's general voice mailbox is full. 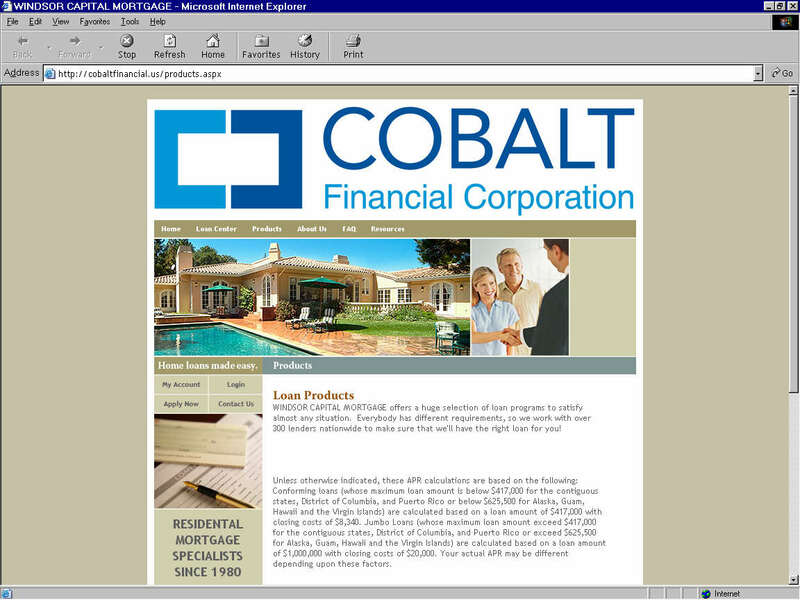 We believe the company simply reinvented itself as Cobalt Financial Corp.. From Cobalt web sites bearing Windsor copyrights or even hosted on Windsor's domain (here's some cached confusion) to the months-long migration of CA licensees from Windsor to Cobalt, family ties, designated agents and upper level executives in common, it seems pretty obvious that the two companies are related. The reason WHY remains a mystery. Windsor Capital Mortgage: From thousands of employees and over $300 million per month, to 2 California Licensees [Update - 2008-10-15: ZERO salespeople on CA DRE site] and a UPS Drop box... we're calling this a "halting of major operations." Original Ailing Listing - 2009-09-23: The list of salespersons still registered under Windsor Capital Mortgage by the California Department of Real Estate is now down to three. One we were able to reach said they were inactive in the business; another indicated they were in the process of getting their license transferred to Cobalt Financial. A third could not be located. Ron Temko, CEO of Windsor Capital Mortgage Corp. still maintains that the company is becoming a "boutique-type" originator, but admits it might not work out. Just over a week after our last update, the Maui Weekly reported a Windsor Capital Mortgage loan officer spoke at a local homebuyer seminar. Since Temko had previously said the company would "basically operate in California," we set out to check whether or not they were still doing business in Hawaii. Trouble in Paradise: Although the online license information states "CURRENT, VALID & IN GOOD STANDING," that's a mistake. The Department of Commerce and Consumer Affairs in Hawaii confirmed that mortgages closed between early May, 2009 to date "should be invalidated." Executive Officer Celia Suzuki, Mortgage and Solicitors Program confirmed that the required $15,000 bond (view cached) to maintain their Hawaii License (view cached) had a "cancel date" of May 4, 2009. On the other hand, there is a chance that 20 licensee's wrote NO business for over 4 months. According to Hawaii Revised Statutes, Chapter 454-3(c): "A mortgage broker's license shall not be in effect at anytime when the bond is not in full force and effect." Chapter 454-8 goes on to say that contracts entered into with an unlicensed mortgage broker "shall be void and unenforceable." Windsor Capital Mortgage Corporation lists 20 Licensees (view cached) in Hawaii. The business address listed at 676 Meakanu Lane in Wailuku may represent another problem. Our online research shows this as a townhome in a residential neighborhood. According to Hawaii regulations, we were told a business address has to be in a business-zoned district to be valid. We are waiting for word from Hawaii if this added twist will invalidate ALL mortgages funded or brokered through Windsor Capital Mortgage in Hawaii. Update - 2009-07-17: We let it rest for a few weeks, then came back for another look: the migration continues. This time, we found ten Windsor Capital Mortgage branch offices appear to have shifted to Cobalt Financial, growing that company's list with California's Dept. of Real Estate to 40 locations along with eight other new branches (there was one duplicate on the list). Another 51 former Windsor Capital loan officers have also crossed over, as both companies are reported to have seen significant change in their salesperson headcounts according to the State's registry. Windsor Capital Mortgage lists 521 salespersons as of 2009-07-17 per the Department's online licensing status portal -- that represents a drop of 90 employees since our last check. Cobalt Financial's ranks have swelled by an additional 112 loan officers, just under half of which were former Windsor Capital employees as verified against prior saved lists. Among those 51 former Windsor Capital loan officers who are now registered under Cobalt Financial is one Randy William Erickson, believed to be the same individual named in the amended complaint filed by Fractional Villas, Inc. on 2009-06-17 as evidenced by both the current results (view cached) in following the link to the web site referenced in the suit and Erickson's present web page (view cached). Coincidentally, both versions of Erickson's sites appear under Windsor Capital's internet domain (windsorcapmortgage.com). Update - 2009-06-24: Another week, and another wave of personnel has disappeared from the ranks of Windsor Capital Mortgage Corp. Thirty-one more salespeople dropped off the California DRE's current licensee list bringing the count down to 611 (nineteen of those reappeared on the list for Cobalt Financial Corp.). 5) an "order or any other remedy necessary or proper for the enforcement of statutes and rules regulating mortgage brokers..."
The State's examination cites the existence of unlicensed branch locations, lack of supervision, and the origination of multiple loans that contained "misrepresentations and/or concealed material facts." Update - 2009-06-17: Windsor Capital Mortgage CEO Ron Temko says the company is "not filing for bankruptcy or closing down," according to a report today by National Mortgage News, adding that "reports the company is filing for bankruptcy are 'not accurate.'" The newsbrief indicated Temko had explained Windsor Capital Mortgage was "becoming a 'boutique-type' mortgage originator." "Approximately two-and-one-half weeks ago, Windsor sent a letter to its branches saying it is establishing minimum production requirements and terminating any branch that did not meet those. Mr. Temko said the company, which once operated in 40 states, would now basically operate in California." Meanwhile, attorneys for Fractional Villas, Inc. today have filed an amended complaint in their copyright infringement suit against Windsor Capital Mortgage Corp., adding the names of two individuals as defendants: Windsor's broker of record Linda Temko, and Randy Erickson. Erickson is a CA-licensed broker employed by Windsor Capital Mortgage at a branch office in Hermosa Beach, CA. Since our last update, we re-checked the CA DRE's records and the headcount of salespersons at Windsor Capital Mortgage Corp has dropped by another 51 LO's, now listing 642 compared to 693 a week ago. In this same 7 days Cobalt Financial has added 41 salespersons, now up to 191. Thirty-nine of them were formerly listed with Windsor. We'll continue the countdown. Anyone can watch the migration with us, as salespeople transfer from one ship to the other. For Windsor Capital, click here; for Cobalt Financial, click here. Update - 2009-06-11: We have been told the plans for a possible bankruptcy of Windsor Capital Mortgage Corp. have been in the works for months according to one source, with loan repurchases being the likely cause. In a phone call we had today with Barbara Ciullo, Secretary and Broker of Record for Cobalt Financial, she "heard" that Windsor was shutting down "by the end of June... Ron [Temko] and Fred [Thrane] want to retire." Barbara at one time was the Broker of Record for Windsor Capital. Additional research and info we've received seems to support prior reports that Windsor Capital Mortgage Corp. is morphing into Cobalt Financial Corp. Ciullo did confirm that the Cobalt President (and major shareholder) is David Temko. "Those originators who have met the MPR have been contacted recently by phone and can ignore this memo. If you have not recently received a phone call, this means our records indicate that over the past year you have not met the MPR. If you fall into this category, effective today Windsor will not be able to continue its relationship with you as an originator and is regretfully terminating its contract with you. We ask that you have any files closed no later than June 30, 2009." "Windsor Capital's web site for loan agents has stopped all activity. The last rate sheets posted to the site are dated May 13, 2009. The message board has had no activity or responses for several weeks, it appears as if it has been abandoned." A screenshot of Cobalt Financial's instructions to potential [contract?] processors confirms the Manchester Ave. address and portends "this is being updated... but not yet complete," indicating the registered Vista Sorrenta Parkway address (Cobalt's formal domicile per CA's DRE record) as the official location. Although there certainly has been an effort to deny a connection between the two companies, both the BBB and the Cobalt web site (cached copy - PDF) show Fred Thrane as the President of each company. Original Posting - 2009-06-04: Tips have been coming in that this San Diego mega broker may be closing shop, or reforming itself under a new name. Windsor Capital Mortgage Corporation, based in San Diego, CA, has been repeatedly touted as one of the top mortgage loan originators in the country, ranking 3rd in 2007 and occupying the #2 spot in 2006 (view cached as cited on their web site. According to a sampling from National Mortgage News, Windsor Capital's total originations for 2007 exceed $2.6 billion dollars. One source tells us employment applications for a new company were sent to a select number of loan officers a few weeks ago. "Rumor had it they had a bunch of lawsuits on the table, and were basically BK'ing Windsor Capital and restarting as someone else," the tipster wrote. There is no bankruptcy filing, but we did find a copyright infringement lawsuit filed 2008-11-12 on behalf of Fractional Villas, Inc. which claims Windsor had copied and was using a "significant portion of the material" published and copyrighted on their web site to market similar products and services on a web site Windsor owns and controls. The suit seeks "not less than $150,000 for each separate infringement" in addition to punitive damages, costs and attorney fees. A month ago, we were told Windsor LO's began running into trouble accessing vendor services, and another tipster pointed us to the possible reincarnation of Windsor Capital Mortgage Corp in the form of Cobalt Financial Corporation. The web sites are remarkably similar in structure and content, and a check of California's Dept. of Real Estate records indicates the designated officer on record for Cobalt (est. 2007-08-14) was also listed as one of Windsor's loan officers with that status having been cancelled as of 2007-07-27. Speaking to one source familiar with the company, we were told Cobalt was a "shell company" set up to offload some of Windsor's bad loans, but another source surmised, "Sounds like they cannot handle the debt obligations... the writing is on the wall." We really don't know. As previously reported in a 2008-11-26 newsletter to premium members (subscription required), we noted that Windsor Capital Mortgage Corporation had announced on a page on their web site (view cached) , "Effective 11/24/08 we are no longer funding any loans through the correspondent channel." This was reiterated in a letter to employees also dated November 24, 2008. It explained that the company would no longer be closing loans as a mortgage banker through its correspondent relationships with Flagstar and Countrywide. "Over the years, we have made several forays into the banking arena. To be quite frank, we've never been too profitable in banking. Additionally, banking loans in the current environment has added an extra element of risk we are not comfortable with. Therefore, effective Monday, 11/24/08, we have decided to no longer 'bank' loans through our affinity banking dept. All business will now be brokered." One insider told us they have around 2,000 loan officers, but "maybe 20% of them are doing any business right now and only a third of those were using the inhouse bank." The correspondent division was reportedly handling about $8 million per month in volume. One source anticipated "the 3 people listed on the corp directory will be out of work." (view cached). More recently, we received information that indicates the company may have as many as 2,400 employees. The web site claims "over 1,800 loan officers who originate loans in 30 states." If you can provide additional information or clarification on this company, we encourage your feedback! You can also post your comments below.